When it comes to makeup, there are no shortage of online tutorials, and it is a very lucrative business: 27-year-old Michelle Phan began uploading beauty tips onto Youtube in 2007 and, 350 videos and a billion views later, she nets over 5 million dollars per year. There is always space, though, for a new voice. One that speaks from decades of experience from performing across the globe, not on the internet to bored teens but in front of paying audiences. One that is famed for her kooky, quirky and rather fabulous visual creations. One that belongs to Marnie Scarlet. 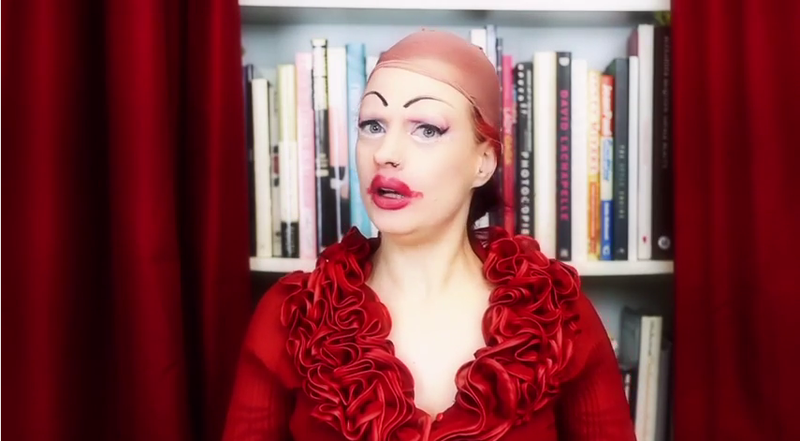 The London-based performance artist originally from the Netherlands has assembled her top tips on how to achieve her spectacular looks in her new Make-Do-And-Mend video. From foundation to hydration, the London Cabaret Awards nominee lays bare for the first time her secrets in just under nine minutes. Truly, we will never look at makeup in the same way again. Roll VT.
You can read more about Marnie Scarlet online over at her website.